All your life you were told the key to success was to go to college and get that fancy piece of paper. Now here you are 40k, 50k, 60k, 80k in debt working with and making the same as people that never stepped foot in a university! What’s worse is you’re getting harassed by debt collectors for money you don’t have! F&%k those loans! Get rid of student debt legally! Student loan debt passed credit card credit card card debt at 1.31 trillion and $779 billion respectively according to the New York Federal Reserve Bank. It’s only slated to get worse as tuition keep increasing way beyond inflation. What’s worse is a college degree is not the ticket to a job that it once was especially if it’s a non science/technical degree. As a result more and more people are looking for student loan help as they fall behind on their payments. If that’s you not to fear there is student loan help out there. Many states also offer various student loan forgiveness programs for your student loans. In fact 46 out of 50 states offer at least one program and some states offering multiple programs to cover a wide variety of loan types. In fact, Kansas offers student loan forgiveness of up to $15,000 for just living in rural parts of the state. Learn more about that here. Before you give up on not qualifying for Federal loan forgiveness programs, check your state and see if they offer any incentives or assistance: Student Loan Assistance programs by State. If you can’t pay back your student loans or just overwhelmed there is student loan help for you. The help depends on whether or not your student debt is federal or private. If your loans are federal the first step is to request a deferment or forbearance of your payments. If approved a deferment or forbearance will allow you to temporarily stop making payments and give you some breathing room to contemplate your next steps. The principle difference between a deferment and a forbearance is during a deferment the interest no longer accrues on certain loans while you are not paying while during a forbearance interest does continue to accrue and you’ll have to pay that back later. In addition borrowers with Direct and Perkins loans may qualify for the Federal Direct Consolidation Loan program. It does just what it sounds like. Just as in private industry this program provides consolidation loans allowing a borrower to consolidate all of his/her loans into a single loan with a lower interest rate. Borrowers with Direct or Perkins loans may also qualify for income based repayment programs where your payments are set to be no more than 15% of your monthly income. If you plan to work in education and/or public service its is highly recommended you keep your loans with the federal government. Why? Because the federal government has a loan forgiveness program for those that work in public service. This is most utilized by teachers, low income servicing clinics, or other public service professionals. Despite the rhetoric on TV yes it is possible to discharge a federal student loan. It’s just really difficult. The best way is to prove ‘undue hardship’. Its important to note that ‘undue hardship’ doesn’t just mean you find it inconvenient or even difficult to pay the loan back. In order to qualify for the ‘undue hardship’ exception one must prove it is pretty much next to impossible for the loan to be paid back in one’s lifetime. A college-educated married couple proved undue hardship and were able to discharge their loans. They both worked, but had income barely above poverty level. The court noted that the borrowers worked in worthwhile, although low-paying careers. One worked as a teacher’s aide and the other as a teacher working with emotionally disturbed children. Even with a very frugal budget, they had $400 more a month in expenses than income. Their expenses included $100 monthly tuition to send their daughter to private school. Relatives paid for most of this and the couple testified that they objected to the public school’s corporeal punishment policy. In agreeing to discharge the loans, the court also found that the couple had acted in good faith because they asked about the possibility of a more affordable repayment plan. In finding undue hardship in a 2011 case, the judge found that a 58 year old and 60 year old couple’s past employment experience showed no likelihood that their financial circumstances would change for the better before they reached retirement age. The judge also considered accrued post-bankruptcy medical expenses in the amount of $22,000. There was nothing in the record to suggest that the medical debt would be forgiven. Both borrowers suffered from various medical ailments. Although there was no medical expert testimony of disability, the borrower’s own testimony was sufficient to who that their health problems limited future employment prospects. The situation improves greatly if you have private student loans. If you have private student loans you are far more likely get out of your student loan debt without paying! Private student loan companies are more apt to settle if you can show that it is unlikely they’ll get the full sum of the loan back. There are several companies that can help you settle student loans for pennies on the dollar including Curadebt and National Debt Relief. You would need to contact them directly to see if your loans are eligible to be settled. They can actually help you get a most or possibly all of your student loan debt forgiven! If you or your school meet any of these criteria your loan is eligible to be discharged through bankruptcy. Plaintiff/debtor listed a disputed debt to defendant Sallie Mae, Inc. on Schedule F with account number [ ] in the amount of $29,774.00, and another loan with account number [ ] (believed to be the same account, under an abbreviated number). The loan(s) alleged in Paragraph 4 were to Desert Sun Helicopter Academy, which is not an eligible education institution within the meaning of 26 USC 221(d)(1) and (2). Sallie Mae, Inc. has claimed in correspondence with debtor/plaintiff that the student loans described in Paragraph 4 are not dischargeable. The fact that the student loans in question were not to an “eligible education institution” under 26 USC 221(d)(1) and (2) means that the debts are not “qualified education loan(s)” under 11 USC 523(a)(8)(B), and therefore are dischargeable. Just as with government loans you cay also have your private student loans discharged under bankruptcy if you can prove undue hardship. You don’t need to drown in student debt. There are solutions out there if your debt load is just too much to bear. The government does have programs that can benefit you and if your loans are private you might be able to settle with your lender (including Sallie Mae) for 30-40 cents on the dollar! Please note that not all Sallie Mae student loans eligible for settlement. The only way to know if your loans are eligible to be settled is to get a free debt analysis. Let’s hope they are! We have compiled a list of reputable debt relief agencies below. When choosing between debt relief agencies it is important that you pay attention and choose a reputable one. Here is our list of reputable debt relief agencies. Can help with student loans? : Yes! Can help with IRS? : Yes! Can help with student loans: Yes! Thanks for writing this article C. William. I have 90k in student loan debt. I’m a stage actor and will never pay it off. Do you think this might work for me? Can you really go bk on a student loan converted into a non student loan? I owe just over $31,000 and I want to try that. Can I get in trouble for that? Yes you can and you can’t technically get the loan with the intention of filing bankruptcy as that would be considered fraud. 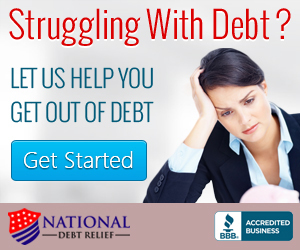 Call national debt relief at 855-224-0820 to see if they can help you out.